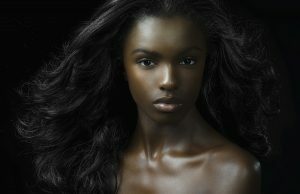 British model Leomie Anderson is most definitely a force of nature. When the 24-year-old isn’t walking the Victoria Secret’s catwalk or starring in campaigns for Nike, she’s using her platform to address issues and injustices facing women today. Anderson has spoken out about the lack of diversity in the fashion industry, calling for brands and media to include more women of colour. 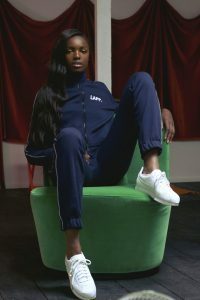 Most recently she’s launched her own brand, LAPP, which stands for ‘Leomie Anderson the Project the Purpose’. The products, and the accompanying website which welcomes female contributors, is “all about empowering women and promoting confidence, positivity and unity through fashion and creating another platform to voice women’s issues”. We spoke to Anderson about what motivates her to push for change, how she practises self-care and why women shouldn’t see each other as competition. “Dropping the Nuditee Collection on LAPP The Brand was definitely a proud moment for me because I genuinely wanted to start conversations about body image and I feel these tees successfully do that. How do you think society views successful women? “The more successful you are, the more assumptions people make about you and the higher their expectations of you. “Self-care is very important but I’m ashamed to say that I’ve been slacking in that department. We all are so focused on achieving as much as possible in such little time and seeing others do so on social media can make you feel like you’re not doing enough. What’s your biggest regret? And what did you learn from it? “Probably allowing a client to cut my hair without speaking to my agency because I felt like I needed to appear professional on my first big money job – I had just turned 17. What’s the one thing you would change or do in 2017 to push women forward?